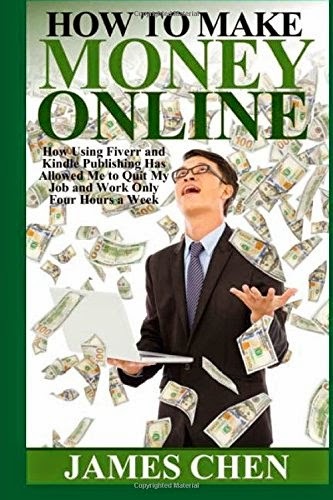 When I saw the title of James Chen’s book, How to Make Money Online: How Using Fiverrand Kindle Publishing Has Allowed Me to Quit My Job and Work Only Four Hours aWeek, I was intrigued to say the least. Yet as I read, I had mixed feelings about the book. Clearly Chen is good at what he does and likely does make a good salary. However, some people might object ethically to Chen’s methods. The book is divided into two major sections. The first one covers Fiverr, and the second one covers Kindle publishing. Most of Chen’s techniques are shared in the Fiverr section. Chen advises that the real money to be made on Fiverr is not by selling a product on Fiverr yourself, but using the Fiverr sellers to supply a product that you sell to someone else for a much higher price. Essentially, if you work as the middleman, you’ll earn much more than if you were selling a service or product on Fiverr yourself. In this chapter, Chen gives tips for people who want to sell their services on Fiverr. He says to make sure that your gig gets noticed. Ask a friend to buy one of your products and give you a review. Or, e-mail Fiverr and ask them if they will promote your gig. Sell business reviews on Yelp. Contact businesses and offer to write a review for $20. Then, hire someone on Fiverr to write the review for $5, and you profit $15. Upsell the client you obtained in the first Fiverr trick and offer the business social media proof through Facebook page likes, Twitter followers or re-tweets, and Instragram or YouTube likes. Offer video testimonials. Have the company write the script or hire someone on Fiverr to write the script. Because most companies think video testimonials are expensive to produce, they will be willing to pay $50 or more. Do everything you can to satisfy your customers so they hire you again. Also, target them for client-only specials and discounts. Chen makes the bulk of his money by sending e-mails to clients offering all three of the strategies given above in one e-mail. Chen also uses Fiverr to create content for books. He says that some popular e-books on Amazon are only 3,000 words. Hire someone on Fiverr to write six 500 word articles, and then bundle them together to make an e-book. Then sell it on Amazon. You now have passive income. Chen moves on to the second major part of the book, selling on Kindle. Chen says the mistake most self-publishing authors make is that they focus too much on one book. Instead, sell more than one book so buyers can find you more easily. The best market is the non-fiction market. Within this section, Chen focuses on narrowing down a topic and choosing a title. He suggests outsourcing the writing and work on the marketing yourself so you can sell more copies. Outsource through Fiverr, Odesk, or Elance. Don’t pay any more than $40 or $50 for a book. Chen also explains how to format your book for Amazon and how to have a catchy description that will get readers’ attention. Use a pen name for each genre that you are publishing in. If you’re not sure what you want to write about, Chen has a suggestion—write a book review of a popular book. You can sell it for less than the actual book, and the buyer doesn’t have to read the book to sound knowledgeable with friends and colleagues. A variety of promotional strategies are given including creating a book trailer and temporarily giving the book away for free or for .99 cents. There’s no doubt that many people will object to Chen’s tactics on a moral basis. In fact, by the end of the book, I was wondering if James Chen was his real name and if he had even written the book. However, Chen is clearly clever, and he’s used that intelligence to make a good living online. If you are someone who is considering, or already, selling your work on Fiverr, you might want to buy this book just to find new and better ways to make more money for the work you’re already doing. At only $2.99 (or free with Kindle Unlimited), you’ll quickly recoup the cost of buying this book. In addition, this book may also open your mind to new ways to make money that you previously had not thought of.